As described in our article cheap GT02 GPS vehicle tracker (Like concox / cothinking) clone review it is not quite easy to find a suitable GPS vehicle tracking terminal. Today we would like to introduce you in the TK103B which is also called GPS103B. That device looks like a GPS tracker from Coban (China), the IMEI also looks like Coban tracker (IMEI starting with 8686830***), but if the tracker is doing his work, who cares about the manufactorer? Many of our clients are using a personal tracker with a car charger adapter to track a fleet and other vehicles. But that is not really a good solution. 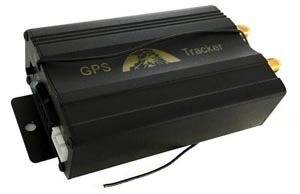 This GPS103B is designed as a pure vehicle tracker which is available for less than $30 - $25 (~ £22). MY-GPS.ORG offers a FREE GPS tracking platform for your GPS tracker. This device is compatible with our web based GPS monitoring server. If you are having trouble with the setup instructions you can take a look at our article setup COBAN GPS tracker for tracking platform. How to connect the GPS103 tracker with a car? Before you can start you have to connect the external antennas. After that insert your SIM card into the tracker. Now you plug the power cord into the socket in the middle of the connection panel. Connect the other side of the power cord with your car battery or your vehicle ignition. If this is the first time the tracker is powered on the first GPS fix (TTFF, time to first fix, time until tracker receives a GPS signal) can take some moments, usually 30-45 seconds. The tracker is now ready to run. 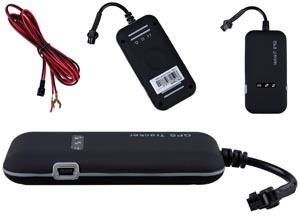 We will offer an extended vehicle ACC (ignition) hardware connection setup manual for the GPS103B / TK103B soon, that manual will guide you through the process of connecting your tracker with your car. FREE nationwide 4G LTE GSM network traffic for fleet and GPS vehicle tracker - Many of our clients are spending to much money on their mobile internet services for GPS trackers. In UK and US you can track your GPS tracker without monthly fees. Find our more in our article FREE GPS tracker sim card in UK or visit our article about Freedompop free data and phones services in the USA1. As most other trackers too this GPS vehicle terminal supports tracking by text message and GPS server platform. If using text message mode you call the tracker and the tracker will reply by text message with position data, speed and moving direction. If you prefer continous tracking text message mode does not really make sense. You would receive hundreds or thousands messages per day. We offer a web based GPS tracking server platform to locate your vehicle on your smartphone, cellphone, tablet or computer on a live map. Watch your driven tracks later, setup geo-fences (alert on entering or leaving a certain area) or let the GPS server send your tracks directly to your cloud storage like dropbox. Try a demo? Just enter our FREE GPS tracking platform demo account or register your FREE GPS tracking platform account now. 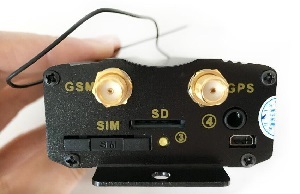 Yes, the SIM card is necessary for the GSM connection of your GPS tracker to your cellphone or a GPS server. But there are too many operators and plans available do decide. We have gathered some mobile operators for you to make your choice easier. Take a look at our article international SIM cards for your GPS tracker where you will find SIM cards without monthly fees and complete free voice calls, free text messages and free 4G LTE GSM network coverage. Where can i order this tracker? If you think that ~$35 are too much you should take a look at the cheap GT02 GPS vehicle tracker (Like concox / cothinking) clone review. That tracker is as simple as possible, quick connection but no internal backup battery and no power save mode. But if you prefer a middle class GPS tracking terminal you should take a look at our middle class GPS tracking terminals. For serious GPS tracking you should have a look at our section high end and professional GPS tracking terminals.